A trial project to reverse the decline of water in the Makauri aquifer near Gisborne is now underway. The objective is to increase irrigation of the Poverty Bay Flats in order to boost land productivity. The project has launched the injection and monitoring phase, pumping high flow water from the Waipaoa River through the pilot bore into the Makauri Aquifer. 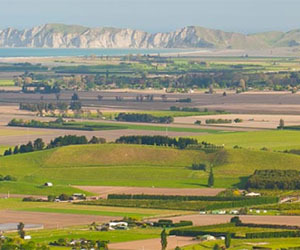 The Poverty Bay Flats comprises 18,000 hectares of New Zealand’s most productive horticulture land. There is currently 3,000 hectares of irrigated land on the Flats producing $160 million in regional GDP annually and employing 1100 people, or about 10% of the Tairāwhiti workforce. Aquifer recharge technology has been successfully deployed overseas and elsewhere in New Zealand, such as on the Hinds/Hekeao Managed Aquifer Recharge (MAR) project in Mid-Canterbury. The Makauri MAR scheme will receive funding of up to $250,000 from the Ministry for Primary Industries’ Irrigation Acceleration Fund (IAF). It is also co-funded by the Gisborne District Council with $230,000 and has received $200,000 in funding from the Eastland Community Trust.